Chief Manno Pekaicheng sits on a log beside a white sandy beach, looking out over a lagoon to a horizon strung with storm clouds. His tiny Pacific island of Ifalik is in trouble; crops are still ruined from extreme high tides that struck a year ago and there is no relief in sight. He is worried about losing his land and his people. Ifalik is part of the Federated States of Micronesia (FSM), a remote belt of islands in the tropical western Pacific. The country is located more than 9,000 miles from Washington D.C., but has its own set of U.S. zip codes. A 1986 agreement called the Compact of Free Association allows citizens of FSM to live and work in the U.S. and serve in its military. The deal was renewed six years ago and several FSM soldiers have died in Iraq and Afghanistan. At first glance, Ifalik seems like an advertisement for a certain kind of paradise. Kids play on outrigger sailing canoes, women prepare lunch over open fires and men bag coconuts to sell to traders who have just arrived by ship, the first in months. But in December 2008, extreme high tides hit the island and others in FSM, damaging homes, eroding coastlines and inundating crops. Pekaicheng says he knows whom to blame. "The big countries are contaminating the whole universe", he says. "And it's getting us before it gets them." FSM is made up of more than 600 islands. The biggest resemble mini versions of Hawaii's main islands, with lush peaks, tourists and cold Budweiser. 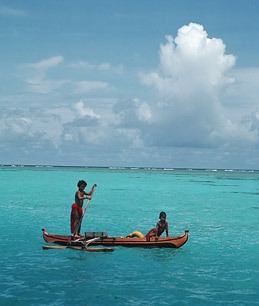 But on low-lying atolls like Ifalik, there is no electricity and transport is typically by sailing canoe. Typhoons can inundate entire islands and droughts can wipe out crops for years at a time. Climate change could do much worse. "Many atoll communities are headed toward the state of perpetual humanitarian assistance," says Charles Fletcher, a University of Hawaii coastal geologist and co-author of a recent report on FSM food security and climate risks. As the water level rises and the danger of damaging tides increase, "the failure to provide food relief could literally lead to starvation," Fletcher says. Kneeling in the mud beside an Ifalik taro patch on an overcast day last November, Thomas Hachiglit, a canoe carver, explains why such a scenario isn't so far-fetched. The starchy yellow blub that grows beneath the plant is the island's staple food. Healthy plants produce firm taros as long as a man's arm. But a year after a so-called king tide inundated the patch with salt water, Ifalik's taros are still the size of a fist and often mushy and foul-smelling. The island's other main crops, banana and breadfruit, are less abundant or seasonal and outside supplies are far off. Only several ships a year visit Ifalik and the journey takes weeks. Hachiglit worries that a typhoon or another king tide will lead to food shortages. "We could flee, but the other neighboring islands are also affected," said Hachiglit. "The only option I see is bigger countries, like Australia or the United States, but that will take years and in that time people will starve." Chief Pekaicheng isn't at Copenhagen, but he has proposed two solutions to his island's climate crisis: send a ship his people can live on or send money to purchase land elsewhere. Neither seems promising. "We just put our lives in the hands of God," he said, "and hope the people who cause all these problems step in and help." FSM and other small island nations argue that global leaders need to limit temperature rises to well below 1.5°C and stabilize greenhouse gas emissions below 350 parts per million. But to the frustration of M.J. Mace, a legal adviser on climate policy for FSM, many larger countries are still focused on a 2°C rise limit. "You can't come together as a U.N.-created body and agree to wipe members off the map," Mace says. "That's what agreeing on a two degree rise would do." Sea levels in the tropical western Pacific rose about 4 inches (10 cm) between 1993 and 2008, according to 2008 NASA satellite data, faster than most other locations on the planet, and far outpacing the global average of 1.7 inches (4.5 cm). A report released on Nov. 24 by a group of leading climate researchers states that seas could rise as much as 3.5 to 6.5 feet (1 to 2 meters) by the end of the century. FSM won't necessarily be off the map, but the map will have changed dramatically. Dr. Rolph Payet, who was the co-lead author of the "Small Islands" section of the fourth report of the Intergovernmental Panel on Climate Change, has taken a keen interest in countries like FSM, which were never really on the map to begin with. "Herein lays the dilemma," said Payet, who hails from the Seychelles, an island nation off the east coast of Africa. "Adaptation and survival that has developed over thousands of years now has to change overnight." Some scientists disagree with those predictions. From the 1940s through the early 1990s, the rate of sea level rise in the region was slower than global averages. Researchers such as Mark Lander, a meteorologist with the University of Guam, believe that the main influence on sea levels in the tropical western Pacific is a complex weather cycle known as the El Niño Southern Oscillation (ENSO). Is climate change turbo-charging ENSO? "Nobody knows for sure," says Lander. About 2,000 FSM citizens a year migrate to the United States, most of them to seek education and work. Like Pekaicheng, many return. "The people of these islands are like the captain of a ship," says Andrew Yatilman, who directs FSM's Office of Environment and Emergency Management and is from Satawal, an atoll famous for its master sailing canoe navigators. "A captain will go down with his ship, and that is the mindset of these people, they will go down with their islands." On a tropical November day, Henry Tasumwaali follows a muddy path through a palm forest on Falalis, an island 40 miles from Ifalik. He points out the school, a narrow tin building that serves grades one through eight and shelters residents during king tides. Behind the building is the islands main taro patch. As on Ifalik, many leaves are still yellow and brown, indicating rotten taro below. Under the shade of a breadfruit tree, Tasumwaali, a spear fisherman with a scraggly goatee, ponders his people's future. "There is nowhere we can go," he says. "When the wave comes again, maybe we will wash away from our island, swimming like a sea turtle in the big ocean."